My journey n tips towards making perfect namkeen sevayin! It was not an easy task to throw away those halua type disasterous javey or sevayin always. I was going through so many experiments of making perfect flavorful sevayin but it was all failure. In early 90s when no google or youtube videos were around to help in getting cooking done perfectly,it was actually a troubled time for me. I was growing up and trying to help my mother in kitchen. Being marwari baniya from a small city we had three kind of options. 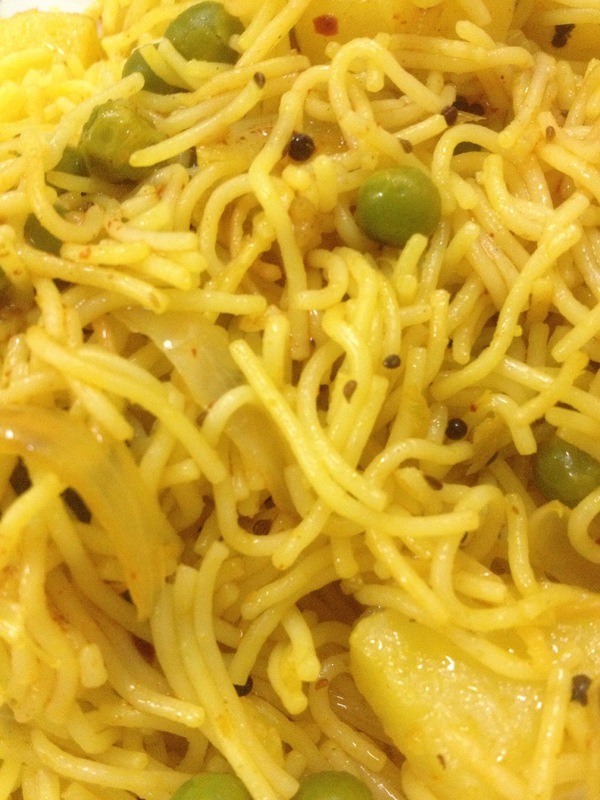 One was home made javey, muslim groccers finely baked hairthin sevain and Maggi. Sometimes it was a pulao type perfect sevayin my Mom used to make and whenevr I tried my hands it was always disaster. It took 22 years to learn how to make perfect sevayin. But now my sevayin are best always.So I thought of sharing my tips with you all. 1- If you are using readymade than boil it in hot boiling water with little oil and salt. 2- First boil water to the bubbling point than add salt than oil than sevayin. 3- If you have plans to add peas and potatoes chunks too than add these too while boiling sevayin. 4- Once boiled perfectly than wash it with cold water and strain all water and keep aside. 5- Always do the frying in cooker.It will give more flavor tomyour namkeen sevayin. 5- Heat the oil or desi ghee and fry some curry leaves alongwith grated garlic for great frangrance. 6- Now add rai(mustard seeds), heeng(asofoetida)and carm seeds(ajwain) to it. 7- Now add red chilli powder, turmeric powder, garam masala, salt and corriander powder. 8- Now add other vegetables like grated ginger, green chillies, grated cabbage, grated carrots and chopped capsicum etc to it. 9- Always add carom seeds for sure to get more flavor. 10-Adding grated paneer will make it very tasty. 11- Now after frying it all very well add boiled sevayin, peas and potatoes chunks to it. 12- Now mix well and sprinkle 2-3 tbsp tomato sauce n mix well. 13- If you wish than you can add few tbsps of ready made pickle’s gravy masala to it too. 14- Mix all very well and close the lid of the cooker. Put the flame to lowest possible. 15- Now close the flame after 4-5 minutes. 16- Open after 10-15 minutes. 17- Make sevayin in desi ghee for more flavor. Why I am folding noodles on fork!